Largest of its kind, The Bridal Extravaganza Show, in Houston, Texas has helped generations of marrying couples have the best day of their life. SOUL READINGS: Schedule and prepay for your session, at my booth, #122, to get 70% off my new client fee. Sessions are available in 20/40/60 minute sessions. Brides & Grooms, families & wedding parties are eligible for a show discount when pre-scheduled at booth #122. New clients accepted during the month of August only. Couples’ sessions encouraged. 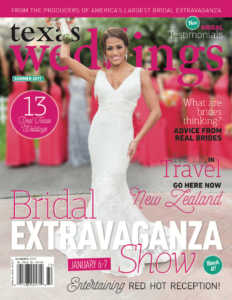 Get a question in the next issue of Texas Weddings Magazine. 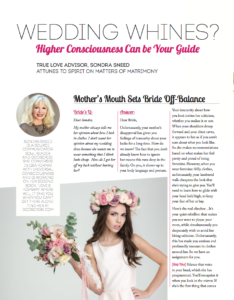 Our True Love spiritual advice columnist, Sondra Sneed, answers questions on the matters of matrimony. 2. You will be automatically entered to win a free 30-minute session. Drawing held at the end of the show.